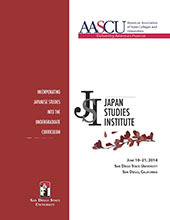 The Japan Studies Institute (JSI) offers college and university faculty members without prior experience in Japanese studies to learn from scholars, business leaders, artists and journalists about Japan, both past and present. The institute encourages participants to develop strategies for incorporating Japanese studies into courses on their campuses. The Institute involves two weeks of intensive seminars, lectures, readings, films, and cultural activities related to Japanese history, culture, literature, government, business, language and education. Previous programs have included topics as diverse as wartime and occupation Japan, social relations and the changing role of women in Japan, Japanese foreign policy and regional relations, classical music, ikebana, calligraphy, survival Japanese, Japanese film in the classroom, and philosophical and religious traditions in Japan. Classes are held Monday through Friday, from morning until late afternoon. The formal program is complemented by a number of off-campus and evening activities. Institute faculty will include scholars, representatives from the local Japanese community, artists, journalists, and government officials. The two week residential program is held on the San Diego State University campus. JSI Fellowships are available to cover most of the costs of the Institute for each participant. While attending the program, participants are housed in shared suites (separate bedrooms, common living area) in a dormitory on the university campus. Because of the intensive nature of the program, families cannot be accommodated and are not permitted to stay in the dormitory. Participants must be faculty members at AASCU institutions who can impact undergraduate education (either through teaching or academic support services that affect undergraduate studies). Participants should not have prior training or professional experience in Japanese studies, and should demonstrate an interest in gaining a better understanding of Japan. Past participants have included faculty in the humanities, social sciences and professional fields, deans, department chairs, directors of international programs and librarians. Applicants must be nominated by their president or chancellor, either directly or at the request of the applicant. Fellowships, provided for all participants, pay for most the following costs: administrative and academic expenses, two weeks of campus housing, up to $700 for transportation, and a $500 stipend for meals and other expenses. Fellowship funds are supplemented by a modest registration fee: $695 (for participants from AASCU-member institutions) and $895 (for participants from non-AASCU member institutions). The Program is multi-disciplinary in content and designed for faculty without prior experience in Japanese studies who wish to incorporate information about Japan into the courses they teach. In addition to the preparatory readings that are made available prior to the Institute, participants receive an Institute Pack containing bibliographical and Internet resources related to Japan, as well as copies of source materials to complement the seminars and lectures that constitute the core of the Institute. The Institute involves four weeks of intensive seminars, lectures, readings, films and discussion groups and cultural activities related to Japanese history, culture, literature, government, business, language and education. While modern Japan serves as the focus for the program, participants are provided with a firm foundation in the pre-modern history and culture of Japan. Previous programs have included topics as diverse as wartime and occupation Japan, social relations and the changing role of women in Japan, Japanese foreign policy and regional relations, Koto music, calligraphy, survival Japanese, film, manga (Japanese comics) and Japanese labor-management relations. Classes are held Monday through Friday, from morning until late afternoon. The formal program is complemented by a number of off-campus and evening activities. Institute faculty will include scholars, representatives from the local Japanese business community, artists, journalists, and government officials. While attending the program, participants are housed in two-bedroom, shared apartments adjoining the university campus. Because of the intensive nature of the program, families cannot be accommodated. The JSI Fellowships and Institute on “Incorporating Japanese Studies Into the Undergraduate Curriculum” are made possible by a generous endowment from the Nippon Foundation. They are managed by the American Association of State Colleges and Universities (AASCU), an association of more than 400 public institutions of higher education across the United States, Guam, Puerto Rico and the U.S. Virgin Islands. San Diego State University provides the academic program and the facilities.